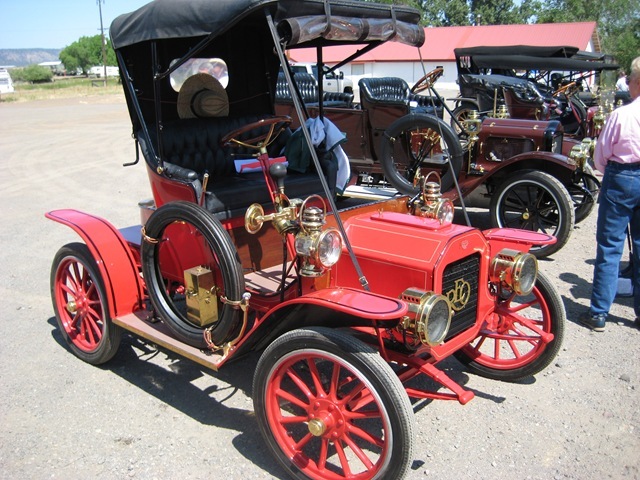 Each June in the very Northeastern corner of California is the Modoc Small Car and M/C tour, held in Alturas, CA. 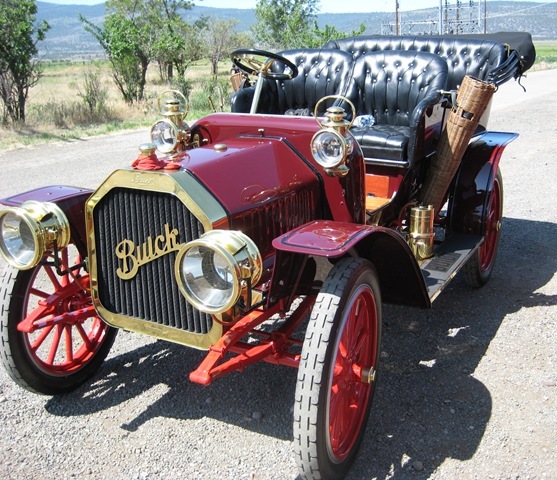 It is for any size car 1907 and earlier, 1, 2, or 3 cylinder cars 1915 and earlier and 1915 and older 1&2 cylinder motorcycles. 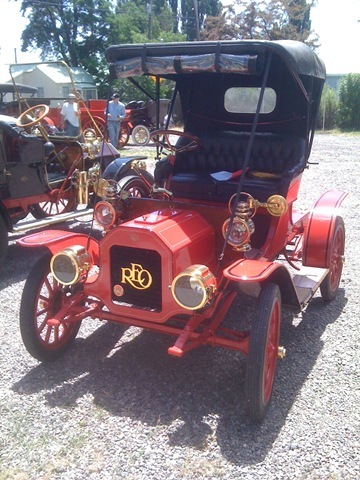 Early steam cars are welcome too! Kim and I took the kids last time, and had a great week. 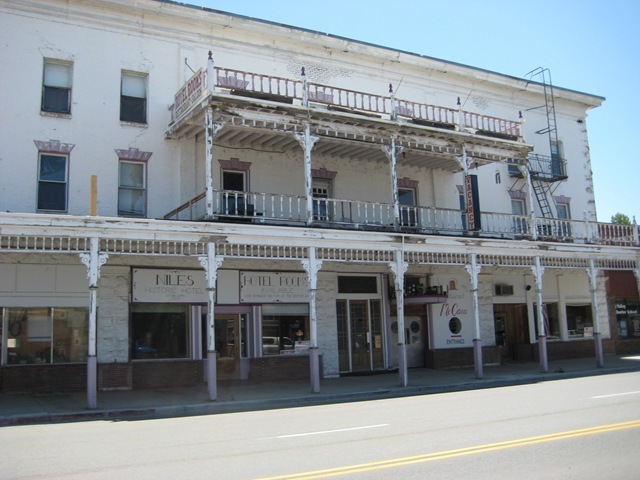 Shown is the historic Niles Hotel, unfortunately no longer in service. Wednesday was a short ride through the local wildlife refuge, with supper at the local Elks Lodge. 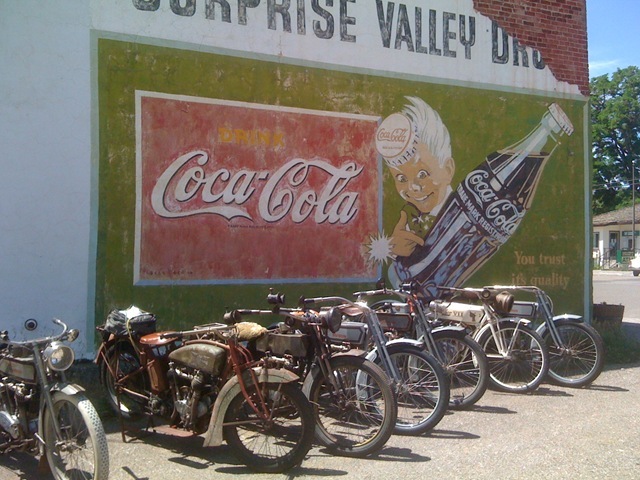 Thursday was the tour through Surprise Valley with a grand outdoor lunch in Fort Bidwell, complete with about a dozen varieties of home made pies! This auto has nice little control levers on the steering column, probably for spark timing and throttle(?). Note the box on the dashboard holding the accumulator (battery). 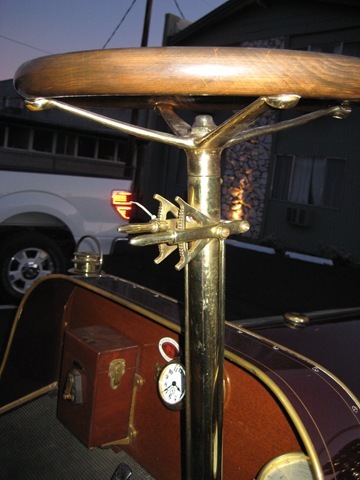 Stuart Speedometer on the dash, with nicely polished brass cable to the gears on the front wheel. Also shown is the number plate at the base of the dash and an 8 day clock just above. Bulb horn, kerosene lamps, lot of levers and pedals. 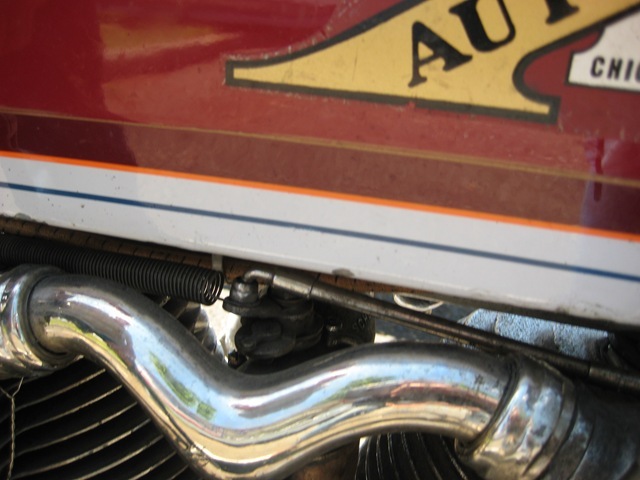 The red rag on the radiator cap catches a small leak that had developed. Before REO Speedwagon was a band, REO was a company that made cars, trucks and speedwagons. 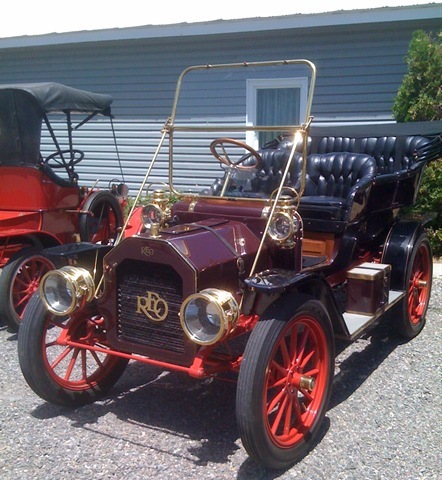 Ranson E. Olds was the founder of the company, he also had Oldsmobile. 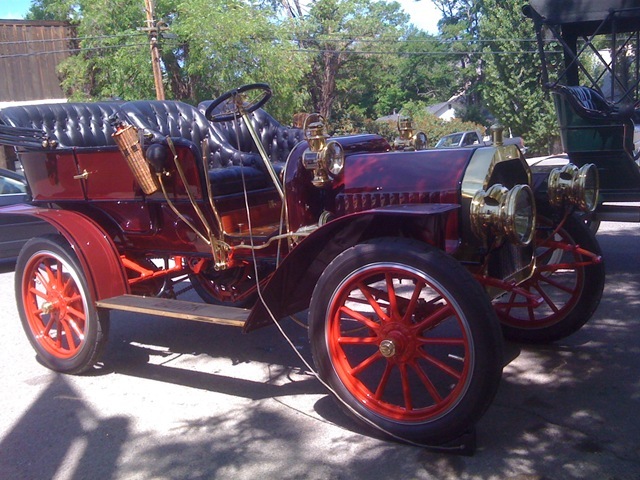 Here are two early cars, a red two seater and a maroon 5 passenger car. Lots of brass to polish…. 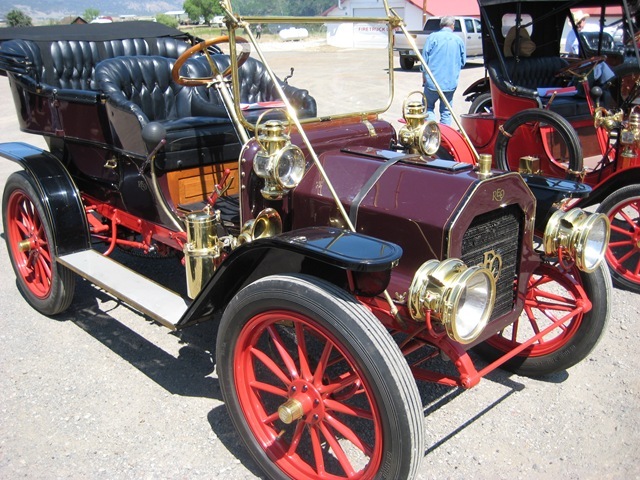 Mike G. left his 1917 Excelsior in the parking lot, and drove his 1904 Holsman highwheeler. What a marvelous contraption. 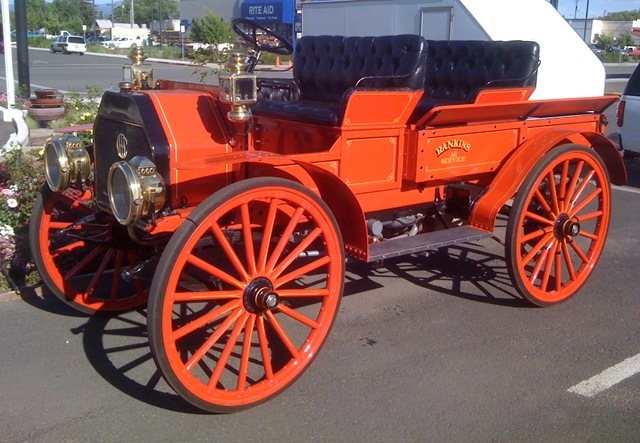 Obviously based on the design of 19th Century horse buggies, it would not have raised too many eyebrows from the turn of the century farmers that were skeptical of the modern autos. 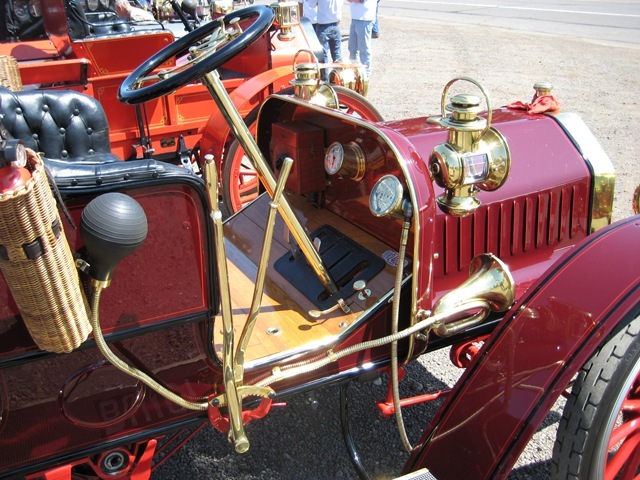 It features tiller steering, which really got Mike’s attention while driving. (note the lack of a steering wheel) The big wheels have a lot of leverage over the steering tiller, and tended to bounce and bop around going down the road. Mike discreetly added a small black steering damper from McMaster, now he can keep it under control. The body was made from sheetmetal, covered in patent leather! Wooden floor boards, leather seat, iron structural bits, brass doodads. Mike rebuilt the drive belts and the lagging in the pulleys, using some very inventive and robust materials. The wheels are a dark green, but it was tough to photograph. Mike had them rebuilt by Amish experts back east. 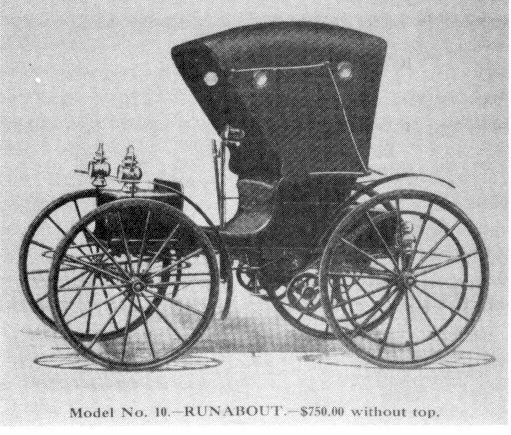 They do not work on motorized vehicles, but made an exception for this one, as it is very much a horse buggy with a small motor added. 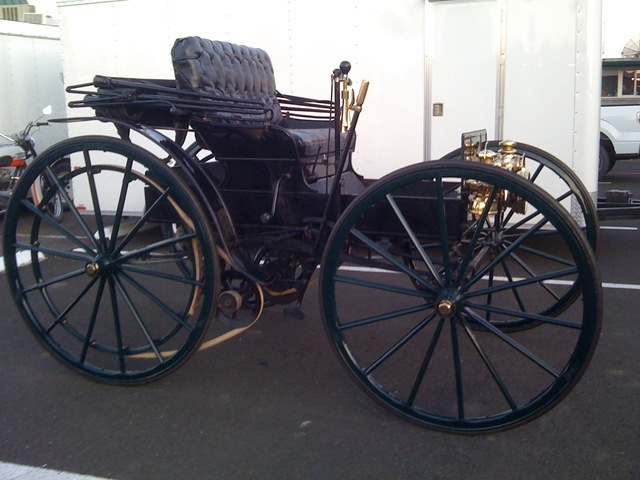 See this link for a similar horse buggy rebuild. 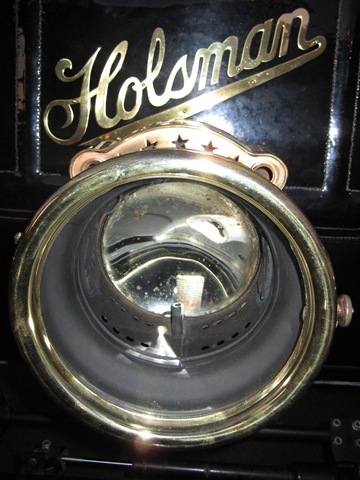 –Some good Holsman info here. Acetylene headlamp is missing its burner. Note the nice venting holes stamped in a star shape, which let the combusted air escape from the top of lamp. You’ve heard of International Harvester, one of the companies that was owned by JP Morgan? They are better known for their plows and tractors than for their early pickups. An interesting tidbit is that Raymond Loewy designed their Farmall tractors in the late 30’s and 1940’s. 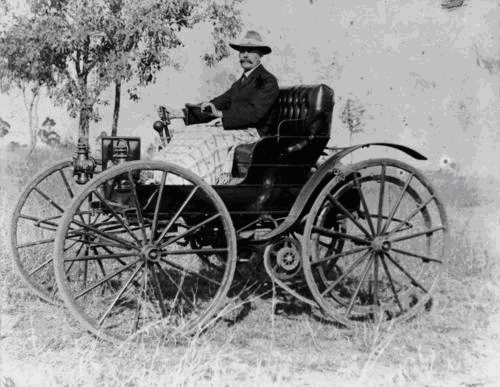 The early vehicle in the photo below had many notable features such as the wood wheels, with solid rubber tires. You can see the joint where the rubber strip was glued together at about 10 o’clock on the front left wheel. 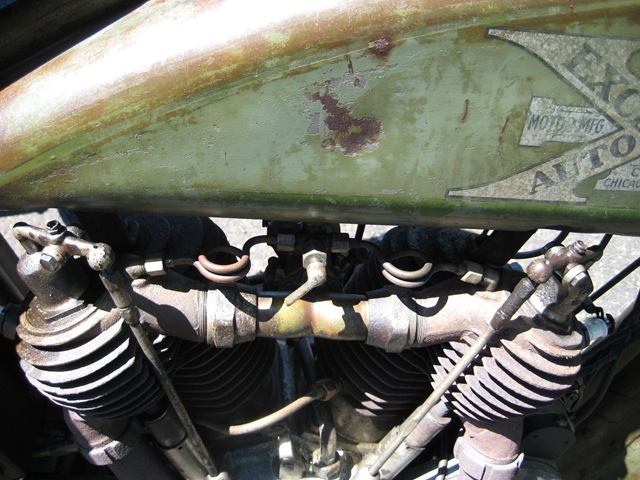 The motor was an opposed twin, mounted under the driver’s seat. The rear seat lifts off, leaving a rather plain pickup truck bed. The story was that you could haul pigs to market all week, then drop the seat in place and take your mother in law to church on Sunday. The IH was a two speed, but the shift dogs were very chunky. It was supposed to be shifted only when stationary (low gear for hilly country, high gear for flat country). It shifted while on the move, it makes a very audible clunk clunk crash CLUNK! sound as it drops into high gear. A bit of shifter dog discussion is here. John (and Kim): Thanks for the treat! What a great bunch of cars and motorbikes. I once rode my 58 MSS/S down Lombard St. but I think I went a little faster. Also it was dark (night). Jim Abbott, Tucson Az, getting hotter by the day. Not much riding after 10 a.m. 100° days.